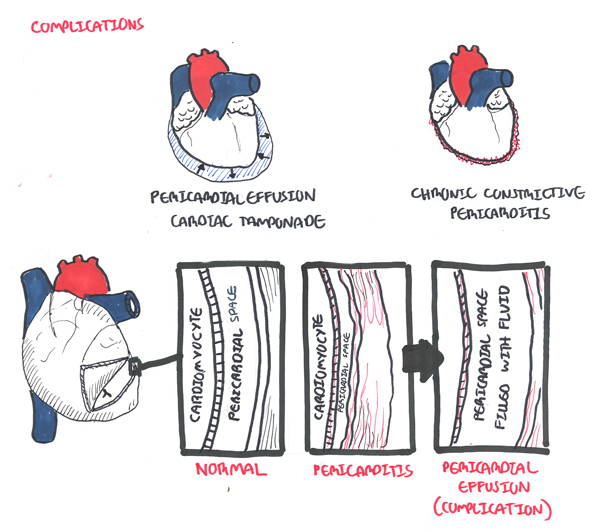 Summary of Pericarditis Pericarditis is inflammation of the pericardium. It is important to rule out other cardiac differentials. Ultrasound is gold standard for diagnosis. Treatment may involve pericardiocentesis if there is significant pericardial effusion. Overview Pericarditis is the most common form of pericardial disease and a relatively common cause of chest pain. The etiology of pericarditis may be infectious (eg, viral and bacterial) or noninfectious (eg, systemic inflammatory diseases, cancer, and post-cardiac injury syndromes). 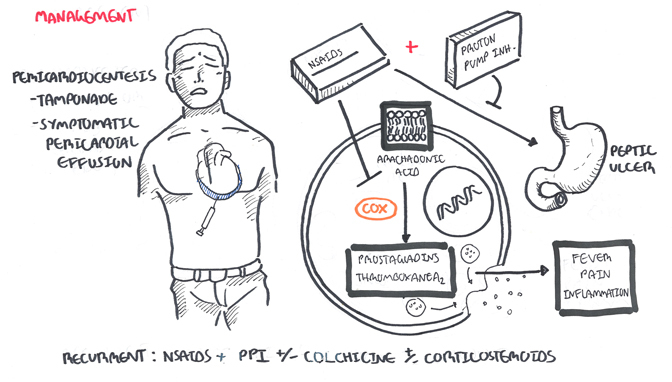 Tuberculosis is a major cause of pericarditis in developing countries but accounts for less than 5% of cases in developed countries, where idiopathic, presumed viral causes are responsible for 80% to 90% of cases. The diagnosis is based on clinical criteria including chest pain, a pericardial rub, electrocardiographic changes, and pericardial effusion. 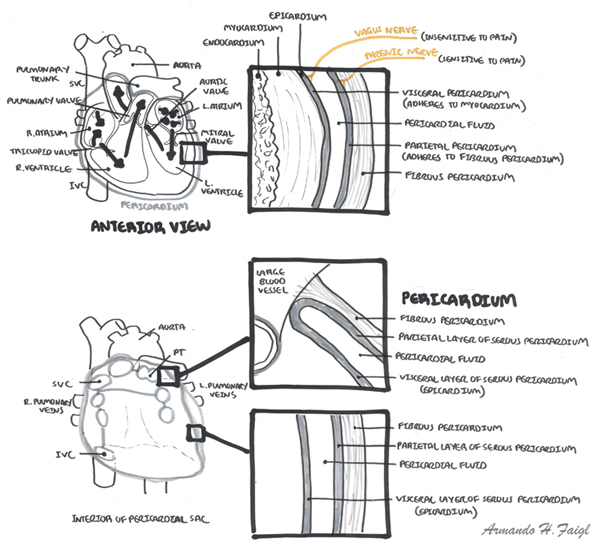 Acute pericarditis: An inflammation of the pericardial sac surrounding the heart. Pericardial friction rub: Harsh, high-pitched, scratchy sound, with variable intensity, usually best heard at the left sternal border by auscultation, due to pericarditis. 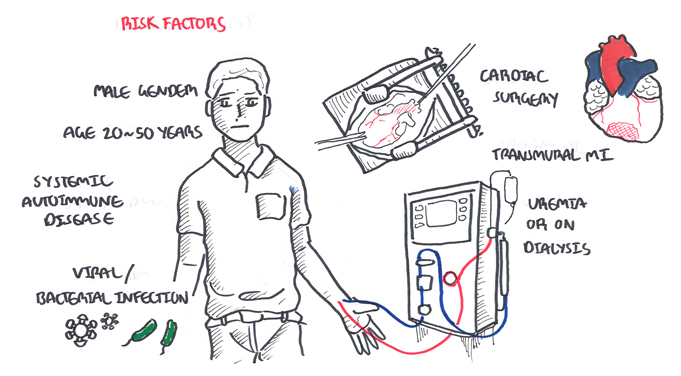 Pericardial Effusion: Fluid that fills the pericardial space, which may be due to infection, haemorrhage, or malignancy. A rapidly accumulating effusion may lead to cardiac compromise. 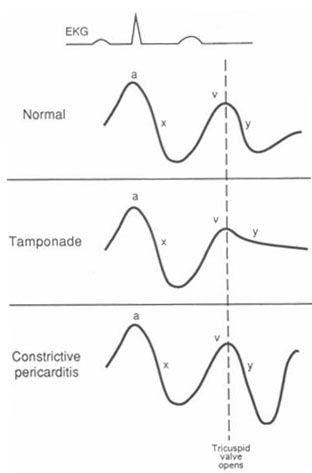 Cardiac Tamponade: Increased pressure within the pericardial space caused by an accumulating effusion, which compresses the heart and impedes diastolic filling. The pericardium is a membranous layer that covers the heart and helps protect it, fixes the heart in the mediastinum and lubricates the heart. The fibrous pericardium is the outermost layer, and it is firmly bound to the central tendon of the diaphragm. Remember Patients with systemic autoimmune disease can have multiorgan involvement, such as pericarditis, nephritis, pleuritis, arthritis, and skin disorders. 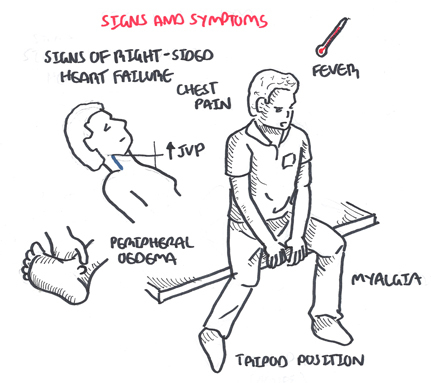 Sharp retrosternal or left-sided chest pain. Remember Prompt echocardiography may be required to determine the presence and amount of pericardial fluid. Acute pericarditis ECG show initial diffuse elevated ST segments ± depressed PR segment. The elevation in the ST segment is concave upwards. 2-5 d later ST isoelectric with T wave flattening and inversion. 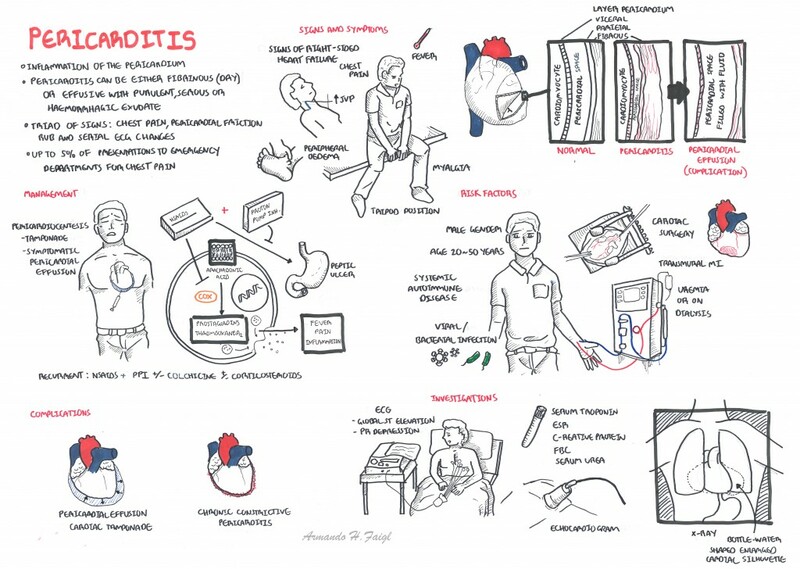 For resistant recurrent pericarditis, seek specialist advice. 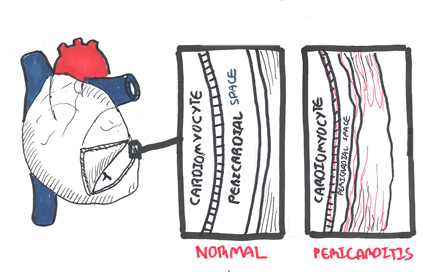 In symptomatic pericardial effusion and cardiac tamponade cardiocentesis is performed.